A Mouse on a Cupcake? It may seem unsanitary but at least it's cute! :D I just love this sweet Whipper Snapper image! I colored it with my Copics and paired it with some fun Cosmo Cricket dp! They aren't your traditional birthday colors but I still like it! Anyway, the sketch I used is actually Karen's Sweet Sunday Sketch! If you haven't checked out her sketches before, you should! Not only are her sketches great but she makes the most beautiful cards! :) She is one talented lady! Well, that's really all I have to say for this post. I guess I have been at a loss for words lately! :D It probably has something to do with this pregnancy. Today was a rough day. Not only was I sick but I was dizzy too. YUCK! I am so ready for 2nd tri to be here! Anyway, enjoy your Thursday! We have our church small group tonight, something I always look forward too! Hopefully I start feeling better so that I can actually enjoy it! Bye, bye for now! A Clean and Simple Picnic! Well, I had better keep this post short today. I am feeling kind of ill (dang morning sickness) and need to grab a bite to eat before it gets too bad! :D I hope everyone enjoys their Wednesday! I am officially 10 weeks along today and I couldn't be more thrilled about it! Technique Lover's Challenge: Magic Marquee Card! Today's card was a BIG challenge for me but I was determined to finish it! Yesterday's Splitcoast challenge was to make a Magic Marquee Card. They are crazy fun but difficult to make if you decide you want to try to adjust the size of the opening like I did! I knew before I started that I wanted to use this adorable SU! set called Lots of Bots and of course my mind couldn't be changed! Haha! And here is the card when it is opened. The magical part of the card is that little window opens up and the "yellow curtains" separate to reveal the little robot! SO FUN! If you want to make your own, you can follow Jan Tink's instructions here. I hope that you are all enjoying your Tuesday! It's a cloudy, cool day here and I am really hoping that it rains. We haven't had rain in weeks and numerous forest fires have started around us. We live only a short while from the National Sand Dunes and the smoke is really billowing from that fire! There is also a large fire just north of us by the Royal Gorge. SCARY! Let's do a rain dance shall we? :) Have a good one! Here's another card for you! This card was made for Saturday's SCS Inspiration Challenge. I can't remember the last time I participated in the inspiration challenges over there and, let me tell you, it was so much fun! I pulled my inspiration from this wall hanging. That's it for today, I plan on getting a few more made this morning and I am SUPER excited! :D Enjoy your Monday! 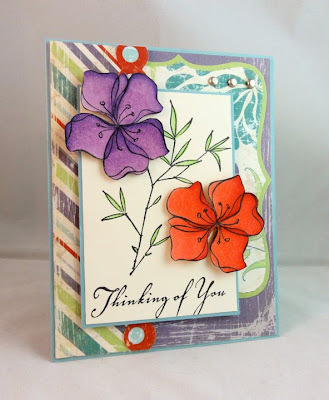 I am posting a card today! WHAT??? I know, I know! It's a miracle! :D Anyway, here it is! This is the very first card I have made since...well...November! I can't believe it took me this long to get back into the swing of things. I had some things come up...some BIG things...and I am just super excited about them! This card was sort of inspired by these recent events. Woah! Crazy huh? I lose my job and end up getting pregnant! Haha! Talk about timing? We are so thrilled though. This has been a long awaited moment, that's for sure. With this new development, we are also seriously considering moving...again! This time, we will probably move back to our home state of Iowa so that we can be near our family. I would obviously miss Colorado but our hearts are just not here anymore. Anyway, back to the card! I made this card tonight using the Splitcoast Sketch Challenge from Wednesday. I decided to finally ink up this adorable Penny Black set that I bought way back in September! These cute little frogs just look so adorable together and I knew they would be perfect for the sketch! The paper is some retired SU! paper as is the ribbon. I colored the frogs with my Copics (I am so glad I decided not to sell them!) and then popped them up on dimensionals! All in all, I think it turned out pretty stinkin' cute considering I have been a little rusty at this card making business! :D What do you think? Ok, that's enough for tonight! Guess what...I made TWO cards tonight which means I will have another one to show you very soon! Yippee! Until then, have a great night!